We wrote earlier this week about Danone’s economic and social interest in restoring ecosystems in different developing countries through its Livelihoods Fund. Danone (with over 17 billion euros in sales in 2010) is a world leader in fresh dairy products. At the other end of the spectrum are dairy farmers like Abraham and Priscilla Kiprotich, who own 6 cows in Kenya’s Rift Valley Province, about an hour’s drive from Eldoret. Like Danone, however, they have a strong interest in planting trees. As one of roughly 1,000 farmer-trainers selected by the East Africa Dairy Development project, Abraham received two spoonfuls of tree lucerne (tagasaste) seeds from the World Agroforestry Centre in 2009. He now has about 200 lucerne trees on his farm. The leguminous tree is more drought-resistant and longer-lived than the ground variety, and improves soil fertility as well. Abraham is expecting a good harvest from the Irish potatoes he has intercropped with trees that survived an acute drought last year. The economic advantages of this tree fodder are clear: the Lucerne tree leaves provide the energy and protein necessary for high milk yields. He has cut down his use of commercial feed (known as “dairy meal”) to just 1 kg a day per cow instead of 4 kg in the past. (A 70 kg bag of dairy meal costs about $20.) And when he is cash-poor he can make do with 6 kg of leaves alone. He also claims that cows are in heat more regularly since they have switched to a tree lucerne diet, and that the calving interval has been reduced as a result from 90 days to 40 days -- that means he can now count on a calf every year. Better organization of the dairy farmers into business associations and growing urban appetite for milk have also doubled the price per liter paid to farmers, making it a good time to invest in dairy feed in this area. But the availability of lucerne tree seeds has been problematic, holding back neighbors who would like to emulate Abraham and achieve greater self-reliance. “We would like to create a modern tree nursery. We could get income from selling trees. That would change the whole area,” said Abraham. In the meantime many farmers have planted trees for firewood and timber, windbreak and shade, by buying fast-growing exotic seedlings and harder-to-find, more expensive indigenous varieties. They are aware of the recent law requiring that 10% of farmland in Kenya be put under tree cover. But they are mainly responding to a better understanding of their woodfuel needs and their long-term environmental interests. 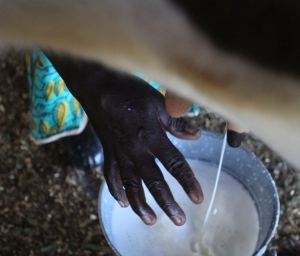 “We cannot excel in dairy unless the environment is sustainable,” said village chief Joseph Cheboi.